Descrizione:Over fifty years as a point of reference for the alimentary world, both nationally and internationally, in the beef, distribution and catering sectors. The Group, born from the entrepreneurial initiative of Luigi Cremonini, has distinguished itself over fifty years as a point of reference for the alimentary world, both nationally and internationally, not only in the historical beef sector, but also in the distribution and catering sectors. In 1963 Cremonini began activity in the beef sector with the creation of Inalca, giving birth to the modern meat industry. At the end of the 70’s a strategy of diversification was initiated, expanding first in the adjoining cured meat sector and successively in two complementary markets: in 1979, with the acquisition of MARR S.p.A., the company entered into the distribution sector of food products to foodservices and in 1980, into the catering sector. In this way the foundation of the actual structure of the Group was laid; production, distribution and catering, which represent today the three main pillars of the company. Today the Cremonini Group, with its head office in Castelvetro, in the province of Modena, employs around 16,000 workers all over the world and in 2017 achieved revenues of 4,031.0 million Euro. 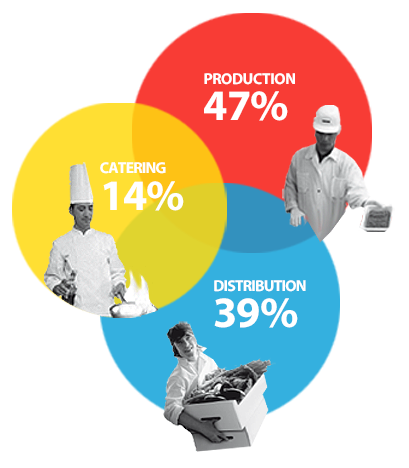 The turnover derives 47% from production activities (beef and cured meat & snacks), 39% from the distribution sector and the remaining 14% from catering. The Group generates 30% of its sales abroad. Cremonini is the first private company in Europe for the production of beef and meat-based transformed products (Inalca, Montana, Manzotin e Ibis) and number one in Italy in the commercialisation and distribution of food products to foodservices (MARR). The company is the leader in Italy in train station buffets and vaunts a considerable presence in the principal Italian airports and in motorway catering (Chef Express). In Europe it is one of the major operators in the onboard train catering. Lastly, the company is present in commercial catering with the restaurant branded Roadhouse. 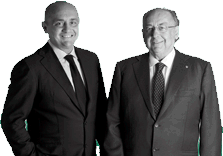 The Cremonini family has complete control of the Group through a holding company called Cremonini S.p.A., which in turn controls three operational sub-holdings: Inalca S.p.A. at 71.6%, Chef Express S.p.A. at 100% and MARR S.p.A. at 50.4% (Company quoted on the STAR Segment of the Milan Stock Exchange) which manage independently their own businesses, operating directly or through parent companies, in their own markets of reference, acting either as market leaders or at an important level. The holding company Cremonini S.p.A., apart from the control of the three operational sub-holdings, defines the strategies of acquisitions and sales, investments in the various sectors and partakes in support activities in the areas of finance, information systems, legal affairs, corporate and tax matters, human resources and public relations. Cremonini, via Inalca, has a stable presence with logistic platforms and production facilities in Russia and various African states, besides developing commercial activities of import/export in more than 50 countries. Moreover, the catering sector has also a strong international presence, particulary in Europe, where Cremonini manages the on board catering trains in 6 European countries. Innovation, technology and safety are the DNA of Cremonini, which has always operated with the maximum respect of the environment for a sustainable development, and in coherence with corporate social responsibility.